Giant Food opened this Herndon, Va., store in November. Landover, Md.-based Giant said Tuesday that it plans to open one new store in Fairfax Circle, Va., and remodel 24 locations over the next two years across its Washington, D.C., regional trade area. The program follows a $21 million investment that Giant announced in late June to open a new store in Olney, Md., next spring. In November, the chain opened two new stores in Herndon and Alexandria, Va., which feature additional space for improved services and product selection. "This announcement is part of our long-term commitment to deliver a consistently exceptional experience for our shoppers," Giant President Gordon Reid (left) said in a statement. "We look forward to updating and enhancing our existing stores and constructing both new and replacement locations to give our shoppers a fresh and imaginative selection, unique in-store experiences and superior customer service." For the upcoming store remodels and relocations, Giant said it plans to add new amenities such as enhanced perishable, produce, beer, wine and liquor offerings; expanded natural and organic departments; hot Asian food bars; and fresh-squeezed juice bars. Other upgrades include full-service floral and pharmacy departments as well as enhanced checkout zones. Giant said the store projects are expected to create 500 new jobs, including the hiring of full- and part-time associates. Overall, Giant Food operates 164 supermarkets in Virginia, Maryland, Delaware and the District of Columbia. The locations also include 154 in-store pharmacies. The investment in Giant stems from a sweeping plan to boost U.S. market share that Ahold Delhaize’s top executives detailed last month at the global retailer’s Capital Markets Day event in Manhattan. Although much of that effort focuses on expanding omnichannel capabilities — via the company’s Peapod U.S. online grocery arm — improved stores are deemed a strategic linchpin for the U.S. supermarket brands, which have seen virtually flat market-share growth. 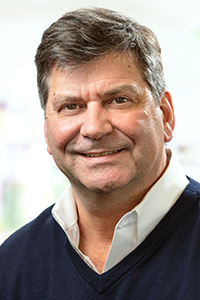 According to Kevin Holt, CEO of Ahold Delhaize USA, the company can take advantage of a “very fragmented” East Coast market, where its stores currently hold a 19% market share while only 11 other retail competitors have at least a 2% share and all have less than a 10% share. 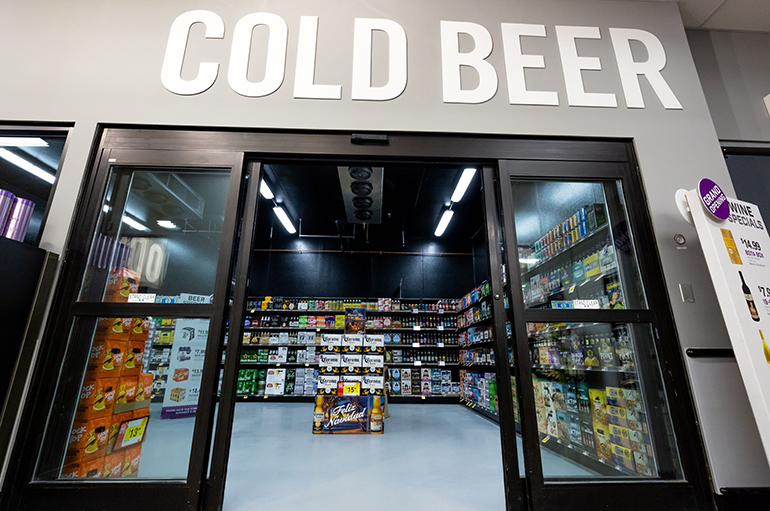 The expanded beer, wine and spirits department at Giant's new Alexandria store includes a walk-in beer cooler. Ahold Delhaize began a brand repositioning of Stop & Shop — the Netherlands-based retailer’s largest business unit — in early October at 21 stores in the Hartford, Conn., area. The chainwide initiative includes a modernized format and a new logo that reflect a more customer-centric strategy based on convenience. Plans call for 60 to 80 stores to be upgraded annually over the five-year program, with capital outlays projected at $1.6 billion to $2 billion across Stop & Shop’s 412 locations. Efforts also are under way Ahold Delhaize USA’s other U.S. grocery chains. Food Lion, which serves the Mid-Atlantic and Southeast, has remodeled about 70% of its 1,030 stores over the past four years under an ongoing upgrade program. Giant/Martin’s, meanwhile, has unveiled a compact store format in Philadelphia that could open the door to more urban locations in its Pennsylvania-Maryland-West Virginia-Virginia market area. Also, the chain last month acquired five Shop ‘n Save supermarkets from Supervalu and, earlier this year, launched a $70 million plan to grow its store base in Pennsylvania. And in New England, Hannaford has established 50 Hannaford To Go curbside pickup locations. Overall, Ahold Delhaize USA aims to more than double its U.S. click-and-collect site to over 600 by the end of this year. Annual sales at Ahold Delhaize USA total about $43 billion. Of its 2,000-plus supermarkets, Stop & Shop, Giant, Hannaford and Giant/Martin’s hold a No. 1 position in 70% of the markets they serve, while Food Lion has a No. 2 share in 30% of its markets. Frans Muller, president and CEO of Ahold Delhaize, said in an interview at Capital Markets Day that the company also will keep an eye on potential acquisition opportunities in the U.S.